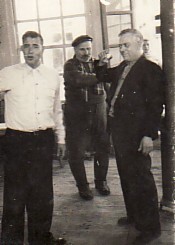 Above: In his kafeneio in Plomari. Ioannis is on the right. Above Right: With family. Standing from left are: Ioannis himself, Georgia Trantallis, Maria Trantallis, Ioannis Trantallis, Mersina and Mersina Trantallis and his wife, Amerisouda. 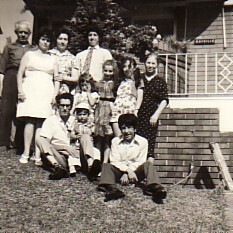 Seated are Doukas P. Trantallis, and, Peter, Lyn, Mary and Christos Trantallis. Above: With family. 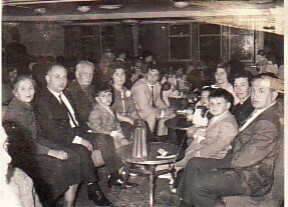 L-R: his wife, Amerisouda; his son, Dimitrios; Ioannis himself with his grandson, Giorgos; Victoria; his son, Efstratios and his wife, Irini; his grandchildren Pauline (Pelagia) and Ioannis; his daughter-in-law, Maria and his son Douka.